Stink bugs are more than just a smelly annoyance. The bugs attack numerous types of fruits and vegetables, including tomatoes, green beans, soy beans, lima beans, sweet corn, apples, peaches, cherries, raspberries, and pears. The stink bug is a "true bug," that is, one that uses its proboscis to pierce the plants to feed. This feeding results, in part, in a dimpled outer surface on the fruits, leaf stippling and seed loss. Be ready for them this year! 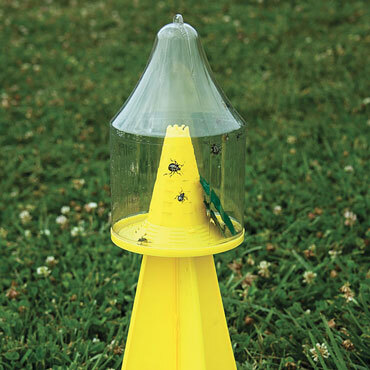 Ambush Stink Bug Trap helps you monitor your garden for the presence of stink bugs—now you'll know when they're present. If infestations are light, the trap can handle them. If you start to notice 2 or more stink bugs per plant, though, you will need to spray an insecticide to help cut down the population. The trap will continue to draw out additional pests for 30 days. Use it outside of your home to help reduce the number of stink bugs entering your house. Traps should be placed 10-20 ft. away from your garden, fruit trees or other plants you are trying to protect. Traps are best placed downwind of any crop you are trying to lure them away from. Pheromone lure lasts approximately 30 days. Simply empty the trap when full, and replace the lure when it's no longer effective. Reusable trap includes one lure.